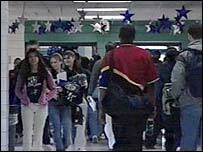 The crowded halls look and sound like those of almost any American school - but Robert M Shoemaker High School in Killeen, Texas is not just any school. It sits right next to Fort Hood, America's largest army base. Of the more than 2,000 students here, more than half have parents or relations who are involved in operations in Iraq. The students are under strain of absent parents, and some mourn parents who will never come home. Shoemaker High School Principal Nelda Howton says the impact on the students is clear. "Tempers are short," she says, adding, "Students who normally have never been in trouble might fly off the handle and get into an altercation with another student." Students' grades have dropped, and more often than not, when they see a student whose grades have dropped across the board, that student has a parent who has deployed, she said. "They just aren't thinking about school," she says. Some of the children are from single-parent homes, and have seen that lone parent head for Iraq. The older children often end up at home alone. Others are taken in by relations or guardians, like 14-year-old twins Laqwon and Raqwon Perryman. They are staying with a neighbour while their mother serves somewhere in Iraq. They have mixed feelings about her absence. "I'm proud my mom's out there. My mom is out there fighting for our country. It's a great honour," one of the twins says. The other says it is an honour for his mother to serve, but he is not sure he would do the same when he gets older because of the effect it might have on his children. The neighbour who has taken them on certainly has her hands full. 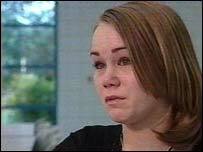 Elaine Mitchell has two teenagers of her own, and her husband is also serving in Iraq. She agreed to take the twins in after discussing it with her children. "They didn't want the children to have go somewhere else and two months later have to come back to Killeen," she says. At a school reserve cadet class, not surprisingly, there is plenty of patriotism on show. Most of these children plan to join the military themselves. But still, there is plenty of debate here about the rights and wrongs of Iraq. "What are we going to have a military for if we're not going to use it?" asks one cadet. But another asks, "Why is it that we're interfering?" To which another responds, "It would be like if America was crying for help. What if we were under Saddam's rule?" Yet another cadet asks, "But why now?" Perhaps the starkest reminder that this is an unusual school is the constellation of hundreds of cardboard stars hanging from the ceilings in the hallways. Each one carries the name of a student and an absent relative. Most are blue and silver. Two are gold, for relations who have been killed. 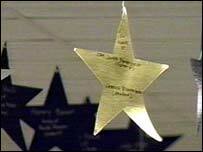 One of those gold stars is for the father of Jessica Blankenbecler, who is just 14. "I think at first I was kind of in denial. He was only there for 17 days," she said. "It didn't even hit me that he had gone to Iraq, and now, it has finally hit me that I'm never going to have him anymore," she added. Among so many of Jessica's friends, the fear is that their father, mother, brother, or sister could be next - yet another hidden cost of the war.